A physical explanation for relativistic length contraction? My last posts were all about a possible physical interpretation of the quantum-mechanical wavefunction. To be precise, we have been interpreting the wavefunction as a gravitational wave. In this interpretation, the real and imaginary component of the wavefunction get a physical dimension: force per unit mass (newton per kg). The inspiration here was the structural similarity between Coulomb’s and Newton’s force laws. They both look alike: it’s just that one gives us a force per unit charge (newton per coulomb), while the other gives us a force per unit mass. So… Well… Many nice things came out of this – and I wrote about that at length – but last night I was thinking this interpretation may also offer an explanation of relativistic length contraction. Before we get there, let us re-visit our hypothesis. The vectors p and x are the the momentum and position vector respectively: p = (px, py, pz) and x = (x, y, z). However, if we assume there is no uncertainty about p – not about the direction nor the magnitude – then we may choose an x-axis which reflects the direction of p. As such, x = (x, y, z) reduces to (x, 0, 0), and p∙x/ħ reduces to p∙x/ħ. This amounts to saying our particle is traveling along the x-axis or, if p = 0, that our particle is located somewhere on the x-axis. Hence, the analysis is one-dimensional only. The geometry of the elementary wavefunction is illustrated below. The x-axis is the direction of propagation, and the y- and z-axes represent the real and imaginary part of the wavefunction respectively. Note that, when applying the right-hand rule for the axes, the vertical axis is the y-axis, not the z-axis. Hence, we may associate the vertical axis with the cosine component, and the horizontal axis with the sine component. You can check this as follows: if the origin is the (x, t) = (0, 0) point, then cos(θ) = cos(0) = 1 and sin(θ) = sin(0) = 0. This is reflected in both illustrations, which show a left- and a right-handed wave respectively. We speculated this should correspond to the two possible values for the quantum-mechanical spin of the wave: +ħ/2 or −ħ/2. The cosine and sine components for the left-handed wave are shown below. Needless to say, the cosine and sine function are the same, except for a phase difference of π/2: sin(θ) = cos(θ − π/2). As for the wave velocity, and its direction of propagation, we know that the (phase) velocity of any wave F(kx – ωt) is given by vp = ω/k = (E/ħ)/(p/ħ) = E/p. Of course, the momentum might also be in the negative x-direction, in which case k would be equal to -p and, therefore, we would get a negative phase velocity: vp = ω/k = –E/p. The frequency in time is easy to interpret. The wavefunction of a particle with more energy, or more mass, will have a higher density in time than a particle with less energy. However, this is a limiting situation – applicable to photons only. Real-life matter-particles should have some mass and, therefore, their velocity will never be c.
Hence, if p goes to zero, then the wavelength becomes infinitely long: if p → 0 then λ → ∞. How should we interpret this inverse proportionality between λ and p? To answer this question, let us first see what this wavelength λ actually represents. So now we get a meaningful interpretation for that wavelength. It is the distance between the crests (or the troughs) of the wave, so to speak, as illustrated below. Of course, this two-dimensional wave has no real crests or troughs: we measure crests and troughs against the y-axis here. Hence, our definition depend on the frame of reference. Unsurprisingly, we just get the phase velocity that we had calculated already: v = vp = E/p. The question remains: what if p is zero? What if we are looking at some particle at rest? It is an intriguing question: we get an infinitely long wavelength, and an infinite wave velocity. How should we interpret this? A physical interpretation of relativistic length contraction? In my previous posts, we argued that the oscillations of the wavefunction pack energy. Because the energy of our particle is finite, the wave train cannot be infinitely long. If we assume some definite number of oscillations, then the string of oscillations will be shorter as λ decreases. Hence, the physical interpretation of the wavefunction that is offered here may explain relativistic length contraction. Even neutrinos have some (rest) mass. This was first confirmed by the US-Japan Super-Kamiokande collaboration in 1998. Neutrinos oscillate between three so-called flavors: electron neutrinos, muon neutrinos and tau neutrinos. Recent data suggests that the sum of their masses is less than a millionth of the rest mass of an electron. Hence, they propagate at speeds that are very near to the speed of light. Using the Lorentz factor (γ), we can write the relativistically correct formula for the kinetic energy as KE = E − E0 = mvc2 − m0c2 = m0γc2 − m0c2 = m0c2(γ − 1). As v approaches c, γ approaches infinity and, therefore, the kinetic energy would become infinite as well. Because our particle will be represented by a wave packet, i.e. a superimposition of elementary waves with different E and p, the classical velocity of the particle becomes the group velocity of the wave, which is why we denote it by vg. Both are the same, and then they are not. The illustration on the right-hand side is a regular quantum-mechanical wavefunction, i.e. an amplitude wavefunction: the x-axis represents time, so we are looking at the wavefunction at some particular point in space. [Of course, we could just switch the dimensions and it would all look the same.] The illustration on the left-hand side looks similar, but it is not an amplitude wavefunction. The animation shows how the electric field vector (E) of an electromagnetic wave travels through space. Its shape is the same. So it is the same function. Is it also the same reality? Yes and no. The two energy propagation mechanisms are structurally similar. The key difference is that, in electromagnetics, we get two waves for the price of one. Indeed, the animation above does not show the accompanying magnetic field vector (B), which is equally essential. 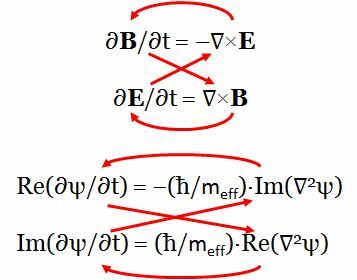 But, for the rest, Schrödinger’s equation and Maxwell’s equation model a similar energy propagation mechanism, as shown below. The only difference is that mass comes in one color only, so to speak: it’s always positive. In contrast, electric charge comes in two colors: positive and negative. You can now guess what comes next: quantum chromodynamics, but I won’t write about that here, because I haven’t studied that yet. I won’t repeat what I wrote elsewhere, but I want to make good on one promise, and that is to develop the idea of the Poynting vector for the matter-wave. So let’s do that now. Let me first remind you of the basic ideas, however. Think of the two oscillations as (each) packing half of the total energy of a particle (like an electron or a photon, for example). Look at how the sine and cosine mutually feed into each other: the sine reaches zero as the cosine reaches plus or minus one, and vice versa. Look at how the moving dot accelerates as it goes to the center point of the axis, and how it decelerates when reaching the end points, so as to switch direction. The two functions are exactly the same function, but for a phase difference of 90 degrees, i.e. a right angle. Now, I love engines, and so it makes me think of a V-2 engine with the pistons at a 90-degree angle. Look at the illustration below. If there is no friction, we have a perpetual motion machine: it would store energy in its moving parts, while not requiring any external energy to keep it going. The point to note is: all of the illustrations above are true representations – whatever that means – of (idealized) stationary particles, and both for matter (fermions) as well as for force-carrying particles (bosons). Let me give you an example. The (rest) energy of an electron is tiny: about 8.2×10−14 joule. Note the minus 14 exponent: that’s an unimaginably small amount. It sounds better when using the more commonly used electronvolt scale for the energy of elementary particles: 0.511 MeV. Despite its tiny mass (or energy, I should say, but then mass and energy are directly proportional to each other: the proportionality coefficient is given by the E = m·c2 formula), the frequency of the matter-wave of the electron is of the order of 1×1020 = 100,000,000,000,000,000,000 cycles per second. That’s an unimaginably large number and – as I will show when we get there – that’s not because the second is a huge unit at the atomic or sub-atomic scale. The (total) energy that is stored in an oscillating spring is the sum of the kinetic and potential energy (T and U) and is given by the following formula: E = T + U = a02·m·ω02/2. The a0 factor is the maximum amplitude – which depends on the initial conditions, i.e. the initial pull or push. The ω0 in the formula is the natural frequency of our spring, which is a function of the stiffness of the spring (k) and the mass on the spring (m): ω02 = k/m. Hence, the total energy that’s stored in two springs is equal to a02·m·ω02. The similarity between the E = a02·m·ω02 and the E = m·c2 formula is much more than just striking. It is fundamental: the two oscillating components of the wavefunction each store half of the total energy of our particle. To emphasize the point: ω0 = √(k/m) is, obviously, a characteristic of the system. Likewise, c = √(E/m) is just the same: a property of spacetime. Note its dimension: the joule is the product of the mass unit and the square of the velocity unit. So that, then, is, perhaps, the true meaning of Einstein’s famous formula: energy is not just equivalent to mass. It’s equivalent to mass that’s moving. In this case, an oscillating mass. But we should explore the question much more rigorously, which is what I do in the next section. Let me warn you: it is not an easy matter and, even if you are able to work your way through all of the other material below in order to understand the answer, I cannot promise you that the answer will satisfy you entirely. However, it will surely help you to phrase the question. For the photon, we have the electric and magnetic field vectors E and B. The boldface highlights the fact that these are vectors indeed: they have a direction as well as a magnitude. Their magnitude has a physical dimension. The dimension of E is straightforward: the electric field strength (E) is a quantity expressed in newton per coulomb (N/C), i.e. force per unit charge. This follows straight from the F = q·E force relation. This analysis involves the curl operator ∇×, which is a rather special vector operator. It gives us the (infinitesimal) rotation of a three-dimensional vector field. You should look it up so you understand what we’re doing here. Of course, you are smart, and you’ll note the phase difference between the sine and the cosine (illustrated below). So what should we do with that? Not sure. Let’s hold our breath for the moment. As a physical constant, with some dimension of its own, it ensures that the dimensions on both sides of the equation come out alright. The magnitude of B is 1/c of that of E, so cB = E, and so that explains the extra c2 factor in the second term: we do get two waves for the price of one here and, therefore, twice the energy. E is measured in newton per coulomb, so [E•E] = [E2] = N2/C2. B is measured in (N/C)/(m/s), so we get [B•B] = [B2] = (N2/C2)·(s2/m2). However, the dimension of our c2 factor is (m2/s2) and so we’re left with N2/C2. That’s nice, because we need to add stuff that’s expressed in the same units. The ε0 is that ubiquitous physical constant in electromagnetic theory: the electric constant, aka as the vacuum permittivity. Besides ensuring proportionality, it also ‘fixes’ our units, and so we should trust it to do the same thing here, and it does: [ε0] = C2/(N·m2), so if we multiply that with N2/C2, we find that u is expressed in N/m2. Why is N/m2 an energy density? The correct answer to that question involves a rather complicated analysis, but there is an easier way to think about it: just multiply N/m2 with m/m, and then its dimension becomes N·m/m3 = J/m3, so that’s joule per cubic meter. That looks more like an energy density dimension, doesn’t it? But it’s actually the same thing. In any case, I need to move on. Just look at it: u is the energy density, so that’s the amount of energy per unit volume at a given point, and so whatever flows out of that point must represent its time rate of change. As for the –∇•S expression… Well… The ∇• operator is the divergence, and so it give us the magnitude of a (vector) field’s source or sink at a given point. If C is a vector field (any vector field, really), then ∇•C is a scalar, and if it’s positive in a region, then that region is a source. Conversely, if it’s negative, then it’s a sink. To be precise, the divergence represents the volume density of the outward flux of a vector field from an infinitesimal volume around a given point. So, in this case, it gives us the volume density of the flux of S. If you’re somewhat familiar with electromagnetic theory, then you will immediately note that the formula has exactly the same shape as the ∇•j = −∂ρ/∂t formula, which represents a flow of electric charge. The physical dimension of the argument of the wavefunction is physical action (newton·meter·second) and Planck’s quantum of action is the scaling factor. The physical dimension of both the real and imaginary component of the elementary wavefunction is newton per kg (N/kg). This allows us to analyze the wavefunction as an energy propagation mechanism that is structurally similar to Maxwell’s equations, which represent the energy propagation mechanism when electromagnetic energy is involved. Now look, once again, at the animation, and remember the formula for the argument of the wavefunction: θ = E0∙t’. The energy of the particle that is being described is the (angular) frequency of the real and imaginary components of the wavefunction. The energy of an ordinary string wave, like a guitar string oscillating in one dimension only, will be proportional to the square of the frequency. However, for two-dimensional waves – such as an electromagnetic wave – we find that the energy is directly proportional to the frequency. Think of Einstein’s E = h·f = ħ·ω relation, for example. There is no squaring here!